Notice how I asked what you think it is that doesn't make the Lions elite to understand your side and opinions. I too dont think the Lions are ELITE as of yet. IMO in order to be elite you have to excell at 4 of the 6 major factions of the game. Special Teams offense - i think we're average here...maybe a tad above but without much of a return game last year thats pretty genereous. Special Teams defense - well below average. we didnt get scored on a ton but didnt exactly excell at stoppuing teams for short gains. I think we're an exciting team to watch, but we have a ways to go before we can call ourselves elite. Special teams was a big weakness for us last year. Stefan Logan disappeared and just wasn't his 2010 self, and I can understand a return TD by Hester here and there, but there was someone on the Panthers who no one even knew about who returned a TD. Hopefully Gunthers changes this year can help our run defense since it should already be good. What effect do you think using wide 9 much less will have on how our defense fares next year? I like the wide 9, but think it has to be used more sparingly that it was in the 2nd half of last year, but injuries may of had a part in how often that set got played. It's too easy to run against the wide 9 and should be used for more 3rd and long situations. I don't know where you get your information from on the Giants, but I don't EVER remember that team running a 3-4. They have always run a 4-3 defense. Once in a great while they may have a 3-4 wrinkle that they run, but it's few and far between. Yeah, you might be right. I thought that too, but I was looking at this (link)... I was thinking maybe it is kind of a hybrid, with a LB up & looking like a DE (e.g. Kiwanuka (sp?). Regardless ... I think my point is the same. When Kiwi entered the league, the Giants already had three really good DEs on their roster (Strahan, Omeyuira and Tuck), but they were lacking at OLB. They had Kiwi start playing their SLB position and found that he could handle it. However, when Strahan retired and Osi got hurt, Kiwi was moved to DE to make up for those losses. With JPP in the fold, Kiwi was asked to stand back up and play LB for them again. Being elite is going to require consistency. Doing it once doesn't make you elite. It gives you the potential, but unless they match or come close to the offensive output of last season I wouldn't consider them elite. Defensively, the injuries made our DL rotation not matter since we were missing 3-4 just about every game after the first 4. Unless the entire DL unit can stay healthy, it doesn't help our average secondary. A Good DL can mask a bad secondary. An average one, which we were for most of the season not being able to get pressure, will allow the secondary to get picked apart, which they did. Spievey played great when Delmas was healthy, but once he went down, he couldn't take the pressure and showed his weaknesses way too often. His 3 early interceptions showed he has the ability, but needs that other safety to be the stopper. Special teams was a mix of rule changes and just bad play. Tackling is fundamental and if you can't get the basics down, you can't be elite. Logan will have a short time to adjust to the shorter kick-off changes from last year or he's a waste of a roster spot. He never adjusted last season and it cost us every game. Currently, the Lions are an up and coming team that could be labeled as very good. They have some elite talent, but as a team, they fall short of elite right now. If they maintain this level then they might crack it, but Detroit doesn't have a history of staying consistent. Hopefully this is the team that can change that. 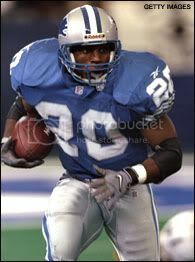 I might reduce my Lions and Bears prediction, if Delmas and/or Urlacher really have knees that could be a factor this year. Both players are desperately needed by each team. I don't think either team can win more than 9 if those players miss a lot of the season. I'm not downplaying Delmas' injury, but I think Urlacher means more to the Bears than Delmas does to the Lions. No you just said that the Lions couldn't win more than 9 games without Delmas. I think we need him, no doubt. But I really don't think our whole season hinges on that one player. Urlacher, on the other hand, is the heart and soul of Chicago's defence. No - but he's the best in an already weak secondary. Painful. Yeah - Urlacher is key, but not as key as he was when they had no offense. Another big blow is Paea being out for a while with an ankle. They were counting on him to take double teams at the nose. The good news is McClellin - and especially Jeffrey - appear to be the real deal. You may be right about that. The Bears offence has improved. That will make a difference.